Every diamond in the world is unique, and as the hardest gemstone on the Mohs scale of mineral hardness, scoring a 10, a diamond’s durability is unsurpassed. The characteristics that identify them are known as the 4 Cs – cut, colour, clarity and carat. The 4 Cs is a universally recognised method of diamond grading, created by the Gemological Institute of America (GIA), to standardise the classification of diamond quality. Below is the anatomy of a diamond to help you understand the terminology that describes a diamond’s features. While understanding the anatomy of a diamond is helpful, it shouldn’t be solely depended on, as these elements are considered when determining a diamond’s cut grade. Table: The largest facet of a diamond or gemstone. It is usually the surface area at the very top of the stone. Crown: This is the top section of a diamond, where the girdle joins the table. 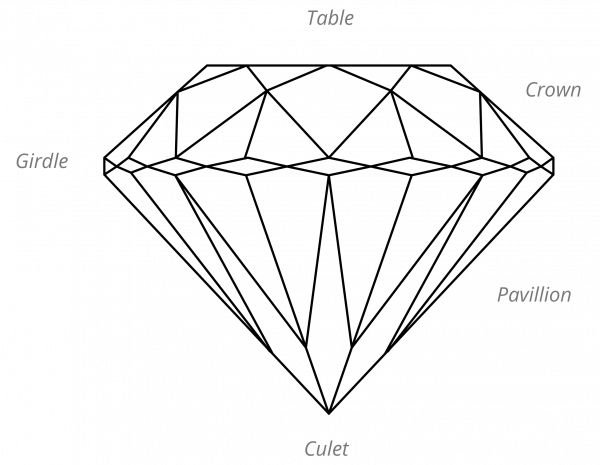 Pavilion: The pavilion is the bottom part of the diamond that connects the girdle to the culet. A pavillion that is too shallow or deep will result in light escaping from the side or bottom of the stone, as opposed to the desired finish of light reflecting out from the top of the stone. Girdle: The girdle sits between the crown and the pavillion and defines the perimeter of the diamond. We recommend a ‘medium to slightly thick’ girdle. Thick girdles are undesirable because they add additional weight to the stone, without increasing the appearance of the stone size. A thin girdle makes the diamond more susceptible to damage. Culet: A small facet at the bottom end of the gemstone, often ending in a tip or point. Depth: The height of a gemstone measured from the culet to the table, noted in a percentage.